Public Kitchen & Bar, located at the Hollywood Roosevelt Hotel, is offering ghostly treats that replicate human body parts (a sight not for the weak!). 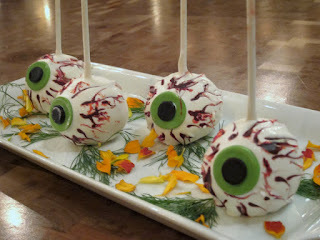 Executive Chef Tim Goodell has created eyeball cakes and “finger” cookies that literally look like the real thing. Pumpkin pies are topped with frozen shards of spiced foam. I tried some of the eye ball cake pops myself and was quite impressed with how they looked!